The chart is based on numbers from the International Monetary Fund. 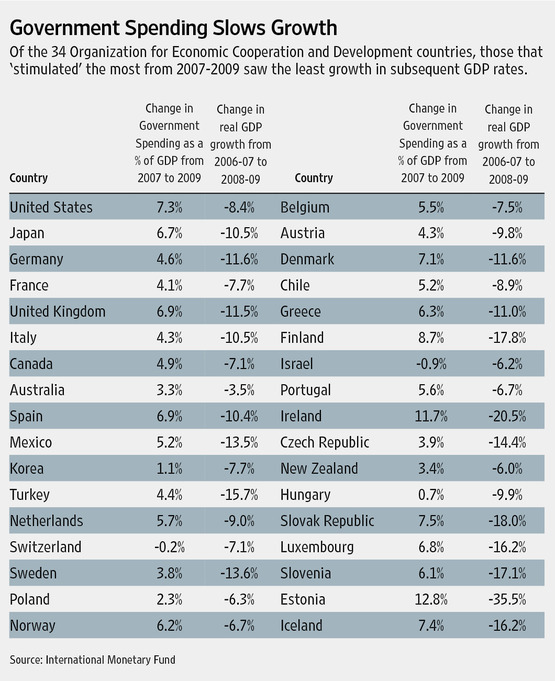 The chart is contained in an article by Arthur Laffer about the impact of government stimulus spending. These numbers are particularly relevant as countries around the world are debating whether or not another round of stimulus spending is the answer to the current recession. Still, the debate rages between those who espouse stimulus spending as a remedy for our weak economy and those who argue it is the cause of our current malaise. The numbers at stake aren’t small. Federal government spending as a share of GDP rose to a high of 27.3% in 2009 from 21.4% in late 2007. This increase is virtually all stimulus spending, including add-ons to the agricultural and housing bills in 2007, the $600 per capita tax rebate in 2008, the TARP and Fannie Mae and Freddie Mac bailouts, “cash for clunkers,” additional mortgage relief subsidies and, of course, President Obama’s $860 billion stimulus plan that promised to deliver unemployment rates below 6% by now. Stimulus spending over the past five years totaled more than $4 trillion. If you believe, as I do, that the macro economy is the sum total of all of its micro parts, then stimulus spending really doesn’t make much sense. In essence, it’s when government takes additional resources beyond what it would otherwise take from one group of people (usually the people who produced the resources) and then gives those resources to another group of people (often to non-workers and non-producers). If the government wants the producers in our society to continue producing, it needs to understand how human nature and incentives work. If I can make more money by not working than I can for working, it doesn’t take a rocket scientist to figure out that I am less likely to work. I think Mr. Laffer is on to something. Please read the entire article at the Wall Street Journal for more information on the impact of government stimulus programs. This entry was posted in Uncategorized and tagged Arthur Laffer, Barack Obama, Fannie Mae, Freddie Mac, Government spending, Gross domestic product, stimulus money, stimulus package, stimulus spending, United States, Wall Street Journal by granny g. Bookmark the permalink.